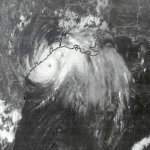 Hurricane Camille was the second strongest hurricane to hit the United States. At landfall the barometric pressure was reported at 900 millibars or 26.58 inches of mercury. This was second only to the Labor Day Hurricane of 1935. Top sustained winds were estimated at 175 mph. The highest official storm surge measured was 24 feet near where the eye crossed land just east of Bay St. Louis, Mississippi. Days later Camille dumped 27 inches of rain over Virginia's Blue Ridge mountains causing extensive flooding. Hurricane Agnes will be remembered for its devastating flooding in the Mid-Atlantic states. 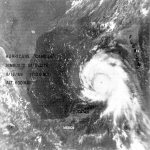 Agnes moved northward in the eastern Gulf of Mexico, and strengthened into a category 1 hurricane before making landfall near Cape San Blas, Florida. As it moved northeastward, it was captured by a mid latitude low pressure center which caused it to stall over Pennsylvania and New York. Virginia, Maryland, and Pennsylvania had rain totals that measured 10-14"+. North Carolina and New York had rain totals of 6-10". Hurricane David was a powerful hurricane that cut a pathway across the Caribbean, eventually making landfall in the southeast United States. Hurricane David raked the island of Dominica before reaching its maximum strength and making the next landfall on the south coast of the Dominican Republic. Top sustained winds were 175 mph. Hurricane David was greatly weakened over the mountainous terrain of Haiti and the Dominican Republic, but started to restrengthen as it emerged off the coast of Haiti. David was moving directly toward Miami, then made a slight shift northwest only hours before hitting the coast. 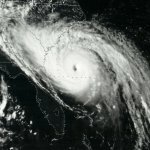 Hurricane David paralleled the east coast of Florida and finally moved inland on the coast of Georgia near Savannah. Hurricane Frederick followed closely on the heels of Hurricane David. Hurricane Frederick moved through the Leeward Islands as a tropical storm after a very brief stint as a hurricane east of the islands. In a similar manner, Frederick hit the Dominican Republic. Frederick made landfall as a tropical storm very near where Hurricane David came ashore only days before. Frederick continued westward near Cuba in a weakened state then started to strengthen it it turned northward. Frederick intensified before making its last landfall at Dauphin Island, Alabama. Top winds were estimated at 135 mph. Hurricane Allen continues as the strongest hurricane on record in the Atlantic basin in terms of wind speed. At it's strongest, top sustained winds were 190 mph with a central pressure of 899 millibars. This was only the second time that a hurricane pressure was measured this low. 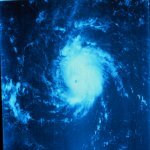 Since then, Allen has dropped to the fifth lowest pressure with Hurricane Wilma, the 1935 Labor Day Hurricane, Hurricane Gilbert and Hurricane Rita all surpassing it. 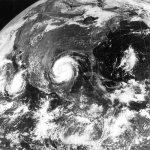 Hurricane Alicia was a fairly small but very costly hurricane to affect the state of Texas. The strongest wind gusts measured were 102 mph at Galveston and 99 mph at Hobby airport. The strongest winds were likely over Galveston Bay. 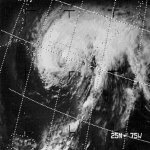 Hurricane Hugo was a long track Cabo Verde hurricane that formed in the heart of hurricane season. It was at its lowest pressure just east of the Leeward Islands. 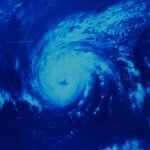 Hugo brought destruction to the northeast Caribbean as well as the Southeast U.S., especially over the state of South Carolina.